After the US transportation recession in 2015 and 2016, the industry was recovering at an every faster pace. In the chart above, note how the red line (2017) outpaced the black line (2016). And 2018 has turned into a transportation boom. March is normally still in the slow part of the year, but this March blew past even June 2014, the banner month since the Financial Crisis! The index, which is based on $25 billion in annual freight transactions, according to Cass Information Systems, covers all modes of transportation — rail, truck, barge, and air — for consumer packaged goods, food, automotive, chemical, OEM, and heavy equipment but not bulk commodities, such as oil, coal, or grains. This kind of surge in volume has consequences in this cyclical business. During the “transportation recession,” orders for heavy Class 8 trucks collapsed, triggering lay-offs and throughout the truck and engine manufacturing industry. The opposite is now the case: Orders for heavy trucks are hitting records. 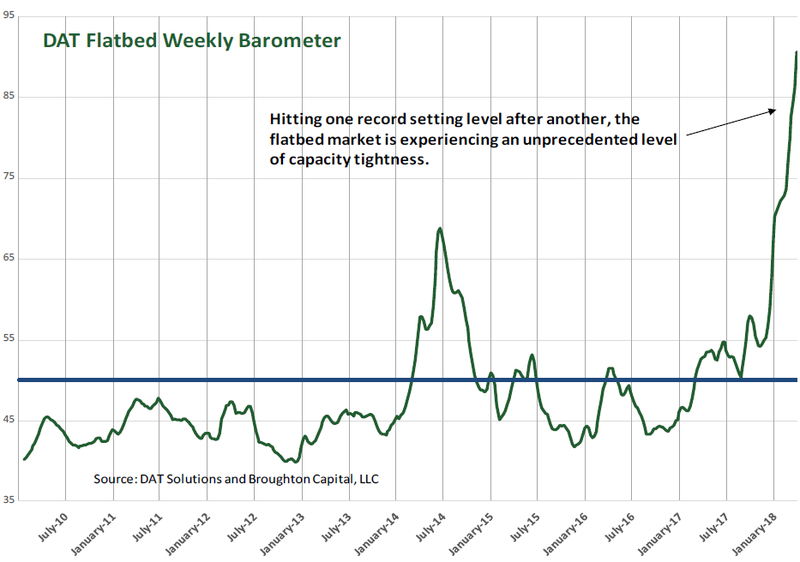 The current capacity crisis may be the worst ever. Capacity is extremely tight and expected to remain this way for months. Fleets need more trucks to handle huge freight demand and continue to order trucks at record setting rates. OEM 2018 build slots are quickly filling up. 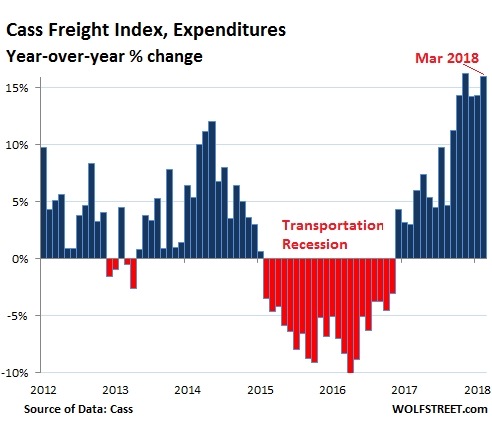 Freight growth continues to climb at a rapid rate. 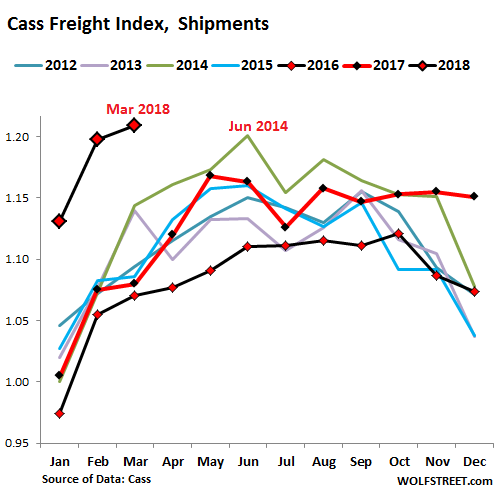 The vibrant economy is pushing dry van and refrigerated van loads to elevated levels and renewed oil drilling is generating a tremendous amount of flatbed freight. 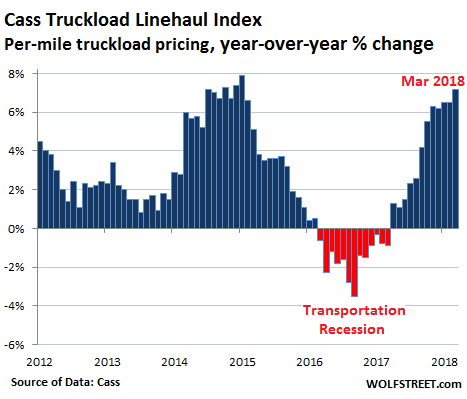 This is confirmed by the Cass Truckload Linehaul Index, which tracks per-mile truckload pricing and does not include fuel – and is therefore not impacted by fuel-price increases – rose 7.2% in March compared to a year ago, the largest increase since January 2015. Similar trend in shipments by rail: The Association of American Railroads reported that in March US railroads shipped 6.5% more containers and trailers (intermodal) than in March last year. Transportation is a boom-bust business. This type of demand, capacity constraints, and pricing power causes transportation companies to increase capacity – hence the record Class 8 truck orders. This will ultimately cause overcapacity to set in, as it always does, and if this coincides with demand that might have peaked by then, the cycle starts all over again. But until then, the boom is on, and prices are rising and capacity is tight, in an environment where inflation is already being pushed up by other factors. My Nephew works for a towing co / hauling co with flat beds in eastern PA. He just towed several vehicles on a flatbed from Phila to Dayton OH for delivery. Somehow somebody got wind that the co was out that way and ruined the dead head back. He had a move from Cincinnati all the way back to Paulsboro , N J. The co is in high demand right now for short notice hauling on the east coast and has just ordered several new trucks to replace older ones. If all these forms of shipping volumes are rising someone must be making stuff and shipping to someone buying stuff. Sounds like a good sign for the economy. I remember living in western NY State (highly not recommended) in the 90s. People noted that Cummins Engine was hiring and that turned out to be an early sign of the economic recovery. Don’t forget about online sales. That’s is mostly moving stuff from point A to point B.
I would say Amazon and other online sales sites are responsible for at least half of this surge. Consumers goods are not truly manufactured in the US anymore, stuff is assembled at most. The phone says made in the US, just don’t look inside. 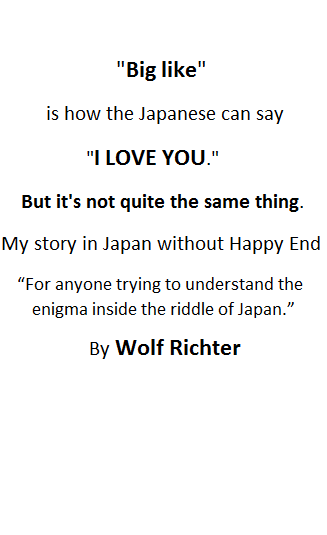 raxadian – I bought a Kyocera cell phone a couple of days ago and it’s … kind of an American/Japanese company? Says Made In Japan on the box. Not made in USA but at least not made in China. I was going to say much the same thing. Shipments are up yet retail is falling. This implies retail doesn’t matter much any more and has gone the way of the buggy whip in a lot of cases. Retail going away is a shock topic. Something is replacing it and in a larger way, just quietly humming away. The invisible hand at work. Can you explain how it is possible there are two ‘visions’. One of declining productivity, lower velocity of money, lesser auto loans / sales, retail going down and the rest of ‘negative’ economic outlooks and the other side so much trafic sending ‘stuff’ arround? As I was reading this report — whose numbers I absolutely believe — but I cannot reconcile the two Americas. 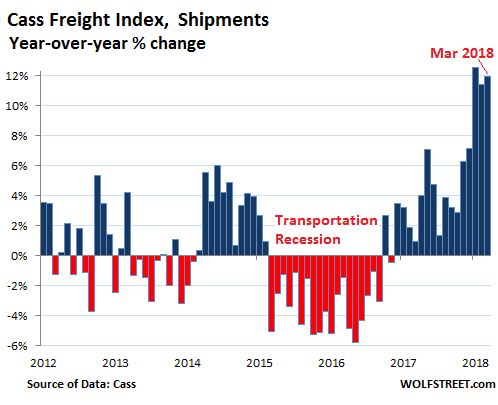 Surely the increasing freight indices indicate increased shipping volume. Increased economic activity. TRULY ! ! Something here DOES NOT ADD UP ! Perhaps it’s this: “Con-game” is derived from the root, “Confidence Game” . The feel good stock market era, fueled by stock buybacks, fueled by ultra-low interest rates — has led to, and continues being, this national confidence game of some sort — causing people to go further into debt to buy buy buy, even as income deteriorates. Such is a positive feedback loop. Self-reinforcing. Prone to continue. Auto loans, ($50K to $60K trucks, huh ?) student loan continued growth, housing sales growth/increase stalling, but the numbers are still OK . . . . . The proles are driving spending with debt, and supporting this rich-man’s economy. I am a prole refusing to spend beyond necessities. I HAVE NO CONFIDENCE IN THIS POTEMKIN VILLAGE ECONOMY. This confidence game, DOING SO WELL FOR NOW, stops when confidence begins to fade. Our positive feedback loop will become a negative feedback loop, something all electrical engineers understand well, and that I believe that all of our so-called economists fear beyond belief. This will stop when it can no longer continue . . . as has been said many times in comment pages for Wolf’s columns. The beneficial positive feedback will be replaced with destructive negative feedback — when the pillars of debt that support this confidence game finally crumble. I AM NOT A PESSIMIST, I am a realist. Your comments are consistent with the drop in the savings rate to historical lows. People are spending and nobody is saving. The retirement dream will evaporate for many. That’s the problem with spending acceleration. Another problem is people have way too much confidence in core institutions like Congress and the Fed. Deep down, people expect to be saved. they think things can’t get that bad. Ultimately they may be right. Once the general population suffers enough, I think we’ll see a wealth tax, debt jubilee, or other redistribution mechanism to calm the masses. There truly is power and safety in numbers. Do not forget about shale, this is where most of the demand comes from. They move a lot of equipment, sand and oil around. The previous transportation recession went hand in hand with difficult times on the oil pitch. But most of that moving around has little value and should be avoided in the first place. If you spend three times more than your competitors per unit of production, there must be something wrong with your business model and it is hardly sustainable on commercial basis. How does this article fit into all the news about the consumer being tapped out with debt, or the GM plants closing, or the retail apocalypse, etc.? It seems like a total contradiction to the doom and gloom articles. I guess online sales is part of this, but it would be nice to see some actual breakdowns of who is shipping what. Consumer borrowing surged last year and this year. Some consumers have reached the end of the line. But many have plenty of room left on their credit cards. Then there are HELOCs and cash-out refis. And don’t forget, many consumers have good jobs, plenty of money, and are doing fine (that was the case even during the Great Recession). My guess of what is behind this: 1) Automatic increases in take home pay from the tax bill passes last year. Enough money to create a little excitment in on-line spending, etc. 2) Increasing interest rates pushing homeowners to pull triggers on equity lines of credit and spend that money (primarily remodels). 3) Minimum wage increases (while not everywhere) are kicking in around the country. 4) Spring is peaking out around the country after what has been a very severe winter compared to many in recent past. Of course the insane federal deficit increase last year and now is stimulating the economy at what appears to be over a trillion annual rate now. That’s a lot of stimulus. All of this is generating more spending. Housing-related a continuing big area because of the easy money mentality that has set in (from rising housing prices in many areas) and becuase it provides almost instant gratification, self indulgance for the owner. Great article. Also you have to note that since last Dec, the FMCSA mandate of electronic logs was put into place which took a lot of trucks off the road. A lot of older drivers and drivers who just don’t want to be tracked all the time took their trucks off the road. I’m in the trucking industry and I own 5 tractor trailers and we run along the East Coast. It’s been very busy the past 4 months but April has slowed down a lot. This is a slightly slow time for us and it should pick back up next month but what goes up must come down. Plus with supply and demand changing everyday in this industry, our bubbles and bursts come a lot faster. As more and more purchases shift to on-line, shipping should continue to be in high demand. I am not a big online shopper, but recently I did order some items from Amazon in Canada. If the experience I had is normal, it may offer some explanation of shipping volume increases. I ordered some rubber flooring to put down in an exercise room. The flooring is rubber tiles 2 ft x 2 ft squares and comes in packages of 6 pieces per pack. I ordered a total of 6 packs. i.e. I ordered quantity 6 of the item in my cart, and processed the order at checkout with 2 day shipping. To my surprise, my order was processed as 6 individual orders of quantity 1 each vs the one single order for qty 6 which I processed at checkout. I had 6 charges on my credit card, I received 6 different emails saying my order has shipped and I received 6 different shipping tracking numbers to track the shipments. They did all show up in the same truck ha ha ha. Each item in it’s own large oversize box. Six large boxes with lots of packaging material, whereas the the 6 identical items could have all easily fit into one box. Crazy does not explain it. So, 6 shipments for 1 single order. Might help explain why shipments are way up while retail sales are not. Anyone else have some similar experience or was this a one-off? Granted this activity was in Canada, so did not impact the profit/loss of the US postal services. Did you get charged six different shipping charges? That is an old scam to boost cash flow for a retailer that operates in the red. And boy, does Amazon operate in the red; never turned a real profit as far as I know. My brother is an accountant and saw this quite a bit when he was a young auditor. I signed up for the 1 month free trial of Amazon Prime which offered 2 day shipping, so no shipping charges. I think you having free two-day shipping may have been a factor, but I am not sure. And not sure how 2-day shipping would be a factor anyhow. Maybe they were boosting their numbers for management ? I buy everything online now, except for food, gasoline and health-care. I buy 75-90% from Amazon, and with other vendors I always specify, “as few shipments as possible” (even if it results in a delay) . I wish I could do that always with Amazon but I cannot. I try to be green as much as I possibly can. What’s the rush anyhow ? I have had some (not many) horrendous, and quite inexplicable, experiences. Some resulting in many separately shipped packages, although no where near as bad as what you described. I think Amazon is all about speed FIRST, and thoughtfulness LAST. More importantly, Amazon has no desire for DIRECT FEEDBACK on the AMAZON-ONLY part of your experience. I suspect they fear they would be buried in feedback, jeopardizing their primary mission — so their motto is DO IT FAST, even if it is done wrong some few times, and then FIX IT FAST, LATER. My worst was a package that was delivered from a town or two over from me here in Massachusetts — instead it went to Nashua, NH — and then spent a few days going to California — and then back here to the N.E, maybe to Nashua or the next town over from me, I no longer remember. They originally told me it would take a day or two, not the almost 14 days it ultimately took. Remains a mystery to this day, perhaps it read the zip wrong, transposing some digits to create some CA-like zip ? I have seen people in my past work life, “manage” the automatic over-sight systems, in such a way as to boost their apparent output, while the actual work done was not increased. A necessary result of soul-less and unforgiving, automated over-sight systems. I guess I’m the black sheep that has avoided Amazon since Christmas. They no longer offer the best price. My last 5 purchases have been on Ebay for rare items, far better pricing and better web experience browsing from the same seller. Once I find one item I often and add another from that seller to save on shipping.. I buy what might be called “easily interchangeable commodity items” on Amazon. “Wrights Copper Cleaner” that is no longer in our supermarket, I buy 6 at a time. Common copper fittings for home plumbing projects, much cheaper than Home Depot. Some wire brushes and grinding wheels to rehab my bench-grinder. A 5 foot piece of 3/4″ solid rubber for a project. Everything I buy is such that I can easily evaluate the suitability, quality and price using the Amazon reviews. If I cannot I delay the buy. As for rare items, I was long-ago a coin collector. There are so many EXCELLENT Chinese fakes out there now, that I would buy no rare coin online. And I would even have trepidation buying from my local dealer too — provenance can be hard to determine. The risk of buying counterfeit RARE COINS is so significant, and potentially hard to detect, that I would not even begin collecting rare coins today, no matter what. People who mock Chinese quality have not seen a Chinese knock-off of a rare-date, high-grade USA coin. I have. Thanks for the tip! Yes it is very true, even a bank up here bought counterfeit gold and sold it to a jeweler. This could be caused by China shipping as many goods as possible to beat tariffs, in which case the fall in shipping demand could be sharp if a trade war actually occurs. The fact that China’s trade surplus has surged recently makes me think this could be the case. Sometimes we get caught looking at things with ‘old eyes’ our methods of gauging the results and the changes are not reflective of new methods of doing things. There is no doubt that more stuff is moving through the system, I have associates who monitor containers coming out of port of LA and at various rail yards and they tell me that volume is huge. Railroads have made great strides in more efficient and fuel effective use of equipment new equipment is less expensive to run and personnel costs are down. It is possible that the traditional methods of judging the strength of the economy are now flawed and we need to reconfigure the reporting. As far as capacity additions go, I doubt that will be an issue for the RR, they have learned their lesson from past cycles and they have ways to make the equipment work harder and they are all very focused on return on capital invested. I am in the flatbed business and have been here about 33 years. The volume of loads have not increased, the bottleneck is the new electronic log books the long haul drivers must now keep. This has cut about 20% of the drivers time behind the wheel. Multiply that nation wide and you don’t have a truck shortage and business has not exploded, you have a work force that can only produce 80% of what they could have last year. The .gov wanted inflation, well they just accomplished that. Is this art a Rerun? I think I made the point that the surge is the transportation recession reverting to the mean. 2016 was the stock market crash that wasn’t, a silent heart attack. We made new highs, but we have the same risk assessment. Now credit is contracting faster then our financial arteries can stand. Blood pressure (inflation) is going up and our tolerance for that change has been compromised. The financial media is not reporting on the credit squeeze, structurally it comes about when the Fed raises rates, but the tax repatriation bill took liquidity away from foreign borrowers, hence LIBOR is on a tear. Prior to 2008 the Credit Card was your healthcare plan, and we all know how that surge in consumer spending turned out. Manufacturing managers have declining optimism (Wolf). The credit squeeze is the real deal, whether its supply, demand or both. While short-term Treasury have risen, I think it’s too early to pronounce a credit squeeze where it counts the most, namely in the high-yield arena. I’m just looking at the junk bond yields (might write about it later today). They have recently declined, and the spread between them and Treasury yields is very narrow. Leveraged loans are booming, and investors have stopped demanding the standard protections (almost all leveraged loans now being issued are cov-lite). This tells me that markets are still not applying any kind of discipline on borrowers. The contradictions we are living with are staggering. The fundamentals of the economy have not changed, but 1) the wealthy are very happy because Trump and the Republicans are giving them much of what they want in terms of tax cuts and deregulation and 2) the white working class is happy with his (mostly false) promises and with his bile directed at people they hate. This gives both of these groups an excuse to splurge, despite the fact that, as I say, nothing much has changed. The rubber will meet the road when credit starts to contract. Perhaps the ballooning Federal deficit will trigger that contraction, perhaps not: it only seems to do that in capitalist societies that start spending lots of money on the poor–tax breaks and military spending, not so much. Anyway, I have given up all hope of prognostication. The system is doomed to collapse, but when is anybody’s guess. Our TL bid is underway (van and flatbed) and our conversations with carriers prior to the bid were not good. We have a great many problems facing the entire US Market for truckload/flatbed freight. Driver shortages, ELD (electric logs), Dwell time (time driver waits at your dock), fruit season (now through June), and overall truck demand is very high. The current cost vs. contracted cost for a TL van lane from Laredo to NH has increased 21% in Q1. On a good note we will see metrics improve greatly with Electronic logs to see the real picture in real time with how drivers actually spend there days driving, waiting, and sleeping. That will help carriers become better stewards of the drivers and maybe even help shippers become faster moving freight from the dock onto the truck. We have heard also that many LTL carriers are seeing overflow of truckload shipments within their networks as well. This occurs when capacity in one mode shifts into another due to lack of vans in the truckload network. How about carriers cut wages for drivers for more clarity. has far outpaced the compensation. Wages are up for drivers so whatever you are reading or assuming is entirely false (and the article you reference states that regarding UPS parcel drivers at the bottom of the article). Some carriers are offering $40K bonus ($10K a year) over four years because they desperately want to retain and keep them. Drivers are in HUGE demand right now. Unfortunately not many people want to do linehaul runs that keep them out for weeks at a time. Flatbed drivers can make six figures pretty easy. I was speaking with a national LTL carrier last night about other customers and one has already spent their yearly budget on transportation in Q1.